"Max Hoelz was considered by the social democrats as a dangerous adventurer, by the official communists as an irresponsible and a traitor, by the communist left as an anarchist and by the anarchists as a Leninist." – Paco Ignacio Taibo II in Archangels. Max Hoelz was born on 14th October 1889 at Moritz bei Riesa. The son of an agricultural worker, he had to start working from an early age to supplement the family income. After elementary school he worked as a day labourer with different landowners from 1903. In 1906 he emigrated to England at the age of 16. He worked in various unskilled jobs in London, using this to finance his evening studies in geometry at technical school, which prepared him for railway building and surveying. He returned to Germany, working as a railway technician in Berlin and as a cinema projectionist in Dresden, and renewed his studies at technical school. Examined for the Army reserve, he was diagnosed as being susceptible to TB and told he should move to a forested area. He got work as a land surveyor in Falkenstein in the Vogtland. At the start of World War I he volunteered for the King's Hussars of Saxony and fought at both Eastern and Western Fronts. He married Klara Buchheim in 1915, the daughter of a haulage contractor in Falkenstein. The war opened his eyes to the nature of the capitalist system, and he was radicalised by the 1917 October Revolution in Russia and by contact with Georg Schumann, a member of the socialist Spartakusbund (Schumann was to be executed by the Nazis in 1945). In November 1918 after a stay in a military hospital Max returned to Falkenstein. He first joined the USPD (United Social Democratic Party – an anti-war split from the Social Democrats) and then the Communist Party (KPD) in 1919, becoming active in the Plauen branch. In February he founded the KPD local group in Falkenstein. As chairman of the Unemployed Workers Council he requisitioned food and fuel for the unemployed, poor and distressed. The mayor and councillors were taken hostage in the town hall after the mayor called the unemployed 'work-shy parasites'. On several occasions the Army occupied Falkenstein to crush the risings. Hoelz had to flee, visiting the KPD party school in Walsrode on the Luneberg heath and was active as an agitator in central Germany and Bavaria. These groups were very active in Saxony, their actions causing a clash between Hoelz and the regional KPD chief, Brandler, who had him excluded from the Chemnitz section of the party. He then joined the KAPD and started sending some of his plunder to the KAPD leadership. Without really taking on board the politics of the KAPD he found it a more affable party to be in. Attached to the independence of the armed groups that he led, he collaborated with the KPD or other groups when it suited him. He became very popular because of his "robbing from the rich to give to the poor". Very often, workers in a precarious position in their factory sought him out. He raised money from employers under threat of reprisals. He liberated prisoners, destroyed deeds and police and legal archives, burnt the villas of the rich and more. He was equally popular because of his constant eluding of capture by the police. In April 1919, a sum of 30,000 marks was put on his head. He was not arrested until after the March Action. After the crushing of the Ruhr uprising, the Army advanced on the Vogtland. After several days fighting, the Red Guard was defeated. Those not captured or shot fled over the Czechoslovak border. Hoelz himself was arrested by the Czechoslovak police and sentenced to 4 months imprisonment. He returned to Germany, and worked undercover. The Worker Communist Daily of the KAPD cheered his destruction of the Victory Column in Berlin, in which he was indirectly involved on March 21st, 1921. On 22nd and 23rd March similar attacks on buildings and offices of the police and legal system took place at Falkenstein, Dresden, Freiberg, Leipzig, Plauen etc carried out by the Hoelz groups and the combat groups of the KPD and KAPD. But in all these towns the workers failed to rise. The only regions where the workers took action were the Ruhr, Berlin and Hamburg. Captured several days after the end of the actions in Berlin, he was sentenced to life. His defence was first of all organised by the communist left, and then with its collapse by the KPD with personalities of the left in a committee set up by the KPD (Hoelz left the KAPD in November 1921 to immediately rejoin the KPD). They put him forward as a leading candidate on their election list in order to obtain his release, but his nomination was not accepted by the State. After his divorce from Klara he married Traute Loebinger on the suggestion of the KPD, in order to maintain regular contact with the Party. In 1926 the anarchist Erich Muehsam brought out his celebrated pamphlet Justice for Max Hoelz. In 1927 the Neutral Committee for Max Hoelz, which included Thomas Mann and Albert Einstein, campaigned for a retrial and the release of Hoelz. Hoelz himself contributed to his own personality cult. The post offices in the towns where he was imprisoned were submerged by mail from all Germany. In July 1928 the Reichstag decided on an amnesty for political prisoners. Hoelz was eventually freed. The marriage with Traute Loebinger ended. Hoelz spoke at a number of different demonstrations in central Germany. In 1929 Hoelz wrote his autobiography From the White Cross to the Red Flag. In August he visited the Soviet Union for the first time. After his return he participated in various KPD events as a speaker. In September he was attacked by the Nazis whilst speaking at Bad Elster in the Vogtland. After several death threats he was advised by the Party to leave for the Soviet Union. The KPD had paraded him around as a star for a while, then when he became too much of an embarrassment because of his outspokenness, wanted to get shot of him. In Moscow and Leningrad he visited training courses at the International Lenin School. In 1931 to 1933 he worked in different mines, factories and agricultural enterprises. He remarried. He began to criticise the bad conditions of the workers. He barricaded himself in his room at the Hotel Lux, the Comintern hostel, in 1932 and he threatened to shoot himself after the NKVD (continuation of the Communist secret police the Cheka under different name) invited him to meet with them in their Lubianka HQ. The NKVD temporarily backed down. He was implicated in the fictional Wollenberg-Hoelz plot against the regime, thought up by the paranoid imaginations of the NKVD (Wollenberg had been a military commander of the workers councils in Bavaria. His criticisms of the Communist Party had led to his exclusion in 1933). The GPU–NKVD thought up a plot in which Zensl, the widow of the murdered anarchist Muehsam, was also later implicated. On 15th September 1933 he died in a "boating accident" – i.e. he was murdered by the NKVD, near Gorky (Nizhniy Novgorod). Hoelz was no anarchist, as the British Trotskyist Socialist Workers Party theoretician Duncan Hallas has falsely claimed. He had distinct authoritarian trends and was not averse to developing a hero cult around himself. Both the KAPD and the KPD had encouraged this. The Communist Worker Daily, the KAPD paper, had declaimed : "Max Hoelz should be our example! Our symbol! Our chief!" He was more a man of action than a deep thinker. 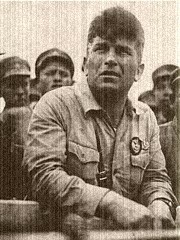 Nevertheless, his willingness to engage in direct action to defend workers, both in the workplaces and among the unemployed and his courage in criticising the Russian regime under Stalin are admirable.